Ravers congregate at BBQ Film’s “Blade Rave” event on Oct. 9, 2015 at Terminal 5, New York, N.Y. Photo: Christopher Gregory, BBQ Films. Last September, Vamped looked into Blade Rave, a BBQ Films’ event that took Manhattan by storm on Oct. 9, 2015 at the Official Afterparty of New York Super Week, presented by New York Comic Con. I caught up with BBQ Films’ co-founder, Gabriel Rhoads, via email, to find out how everything panned out for them. Erin Chapman: How many people attended the event? Did the tickets sell out? Gabriel Rhoads: We had about 1,000 people attend the event. While we did not reach venue capacity, we had a packed house. EC: How much money was raised for charity and which one did the money go to? GR: We raised money for the American Red Cross of the Greater New York Region. We were able to raise more than $1,100 for the cause, and our producers also donated their (real) blood in a blood drive to support those who need it. I now know I am type O Positive, and BBQ Films encourages anyone who can to donate blood to their local Red Cross. EC: Did you attend the event and take part in the blood shower? GR: I did indeed. I played a small MC role in the event, and was in the crowd as the rain started to fall. I was struck by two things. First, since the blood, while safe, was messy, everyone put their cell phones away in the plastic bags we provided. The effect was astonishing: a concert without glowing phones everywhere. It actually looked like a rave from the 90’s. Second, people were just beside themselves for the rain. They had so much fun: the looks of joy were wonderful. 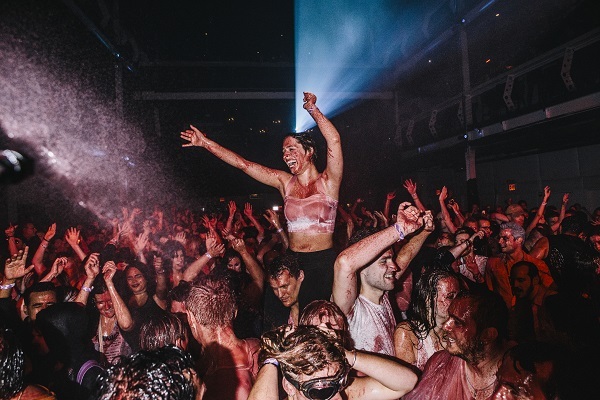 Ravers get doused in synthetic “blood.” Photo: Christopher Gregory/BBQ Films. EC: I have to ask about clean-up. What is the process like for something like this? GR: The largest production feat for this event (and likely that we’ve done to date) was to carpet 4000 square feet of this venue day of to prevent slips and falls, and then remove the carpet that same night. EC: Did Blade make an appearance? If so who played the famous vampire slayer? GR: We were fortunate to have an appearance by Jessie Harris, a famous Blade cosplayer. Jessie Harris, famous Blade cosplayer, takes the stage. Photo: Christopher Gregory/BBQ Films. EC: What size of team did it take from your company to pull this off? What were the man hours for prep on a project like this? GR: We have a crew of roughly 9 producers, 3 key grips, 3 strategy advisers, and a large cast of characters and volunteers. Our ‘film crew’ of volunteers is over 200 strong, but not all support each event. EC: Do you plan on making this an annual event and do it all again next year? Or do you think a new concept is in order? Will you be partnering with New York Comic Con again? Vamped looked into Blade Rave: Erin Chapman, “It’s Raining Blood! 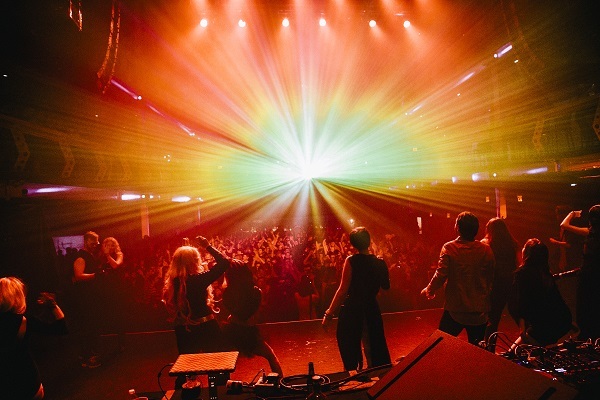 Blade Rave Takes Manhattan,” Vamped, Sept. 9, 2015, accessed March 7, 2016, http://vamped.org/2015/09/19/its-raining-blood/. I caught up with BBQ Films’ co-founder: I e-mailed Gabriel Rhoads my questions on Dec. 2, 2015. He replied on Dec. 30. My questions and his replies comprise the interview in this article. For further information on the event, see BBQ Films’ “Blade Rave” page. If you’re interested in other BBQ Film events, make sure to check out their latest one for the undead: Beetlejuice’s Wedding.